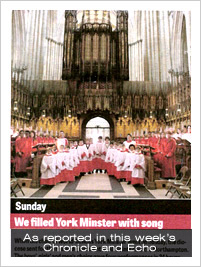 For the final weekend of the summer half-term, 18 boy choristers, 18 girl choristers and 18 men travelled to York Minster to sing the weekend services whilst the renowned Minster Choir was away on its own half-term break. 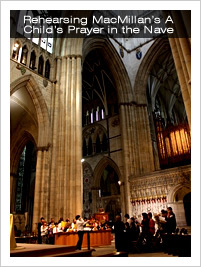 For several, this was essentially a return home – our own Director of Music, Lee Dunleavy, was Organ Scholar at York Minster in 2004-2006, and he was then succeeded at York Minster by Richard McVeigh (Organ Scholar 2006-2008) who joined us as Organist on this occasion. whilst the anthem was the fabulous ‘Sing Praise to God who reigns above’ by Mr Moore’s predecessor as Organist and Director of Music, Dr Francis Jackson (Director 1946-1982). For the Eucharist Service, sung in the Nave, we combined all three choirs to ensure maximum impact in the vast gothic space. Returning to repertoire familiar from our tour of Paris in 2011, the setting of the Eucharist was the Keble Missa Brevis by Philip Stopford, but here combined with the touchingly beautiful ‘A Child’s Prayer’ by Dr James MacMillan, written to commemorate the children who lost their lives in the massacre in the Dunblane primary school in 1996 . With the girls’ choir providing the haunting solo lines, this enabled us to make the most of our combined forces, utilising the space and the acoustic to maximum effect. unfamiliar the All Saints Choristers, here the music returned to the ever-popular Victorian stalwart of the British choral scene, John Ireland (Morning Canticles in F) and Charles Wood (‘Expectans Expectavi’). Although perhaps unused to the stamina demanded in performing two choral services directly one after the after (and particularly when late-night excitement and midnight feasts had perhaps kept some of the younger members up later than perhaps it should! ), the boys and men put on a good show, and were soon tucking into well-deserved packed lunches, as the rain which had dogged every swift walk from coach park to Minster held off for long enough to enable us all to picnic in Dean’s Park, in the shadows of the fabulous Minster. For the boys, the hard-work was now done, and as soon as lunch was over they headed off to the Yorvik Viking Centre to experience the sights, sounds (and smells!) of York past and present. It was now the turn of the girls, who joined the men (who really hadn’t had a break at all, but were still irrepressibly cheery!) to prepare for Sunday Evensong, and the final service of our residency. Here the relatively unknown canticles in G of Henry Smart were combined with the uplifting ‘Laudate Dominum’ of Aaron David Miller, another American composer whose work is unjustifiably overlooked over here in the UK. ‘joy-filled services’, ‘the tremendous sound’ and ‘interesting and unusual music,’ and others described the choirs’ performances over the weekend as ‘some of the best singing we’ve heard from a visiting choir for years’. 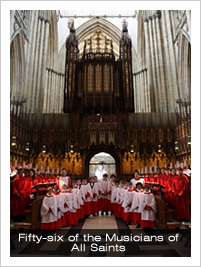 The next Cathedral visits for the choirs are Ely Cathedral, on 7 July, where the boys’ choir will be joining massed Cambridgeshire choirs for a concert performance of Berlioz’s Te Deum, and then in September and October they can be heard performing at King’s College, Cambridge, and at Peterborough Cathedral.